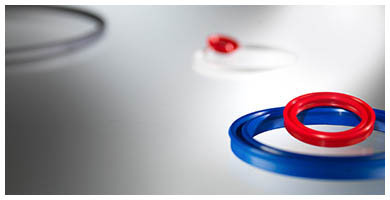 The division of Hydraulics and pneumatics of DIMER offers a comprehensive range of sealing elements and systems from elastomers, thermoplastic materials, PTFE (polytetrafluorethylene) and composite materials for static, rotary, reciprocating and special applications. The well-proven geometry of the seals in combination with diverse, but specifically targeted input material is able to seal also atypical needs of our customers. By creating a properly designed assembly you will achieve the required sealing effect together with long-term durability. We are able to fulfill your requirements - from design to implementation, including service. An integral part of this group of sealing elements are O-rings - round sealing elements with high accuracy, special X-rings– with square cross-section and RSS - Radial shaft seals-ring grooves, RSS-GASKETS and other combinations of sealing elements. Wide material and dimensional variations allow to perfectly seal up all liquids and gases within all industrial sectors. We also offer a well-proven range of complete sealing sets - Seal kits for construction machinery-Sealing sets for construction machinery and sealing pistons - -Pistons for construction machinery- Pistons in construction machinery for construction machines, excavators, truck cranes, hydraulic hammers, etc. We are ready to recommend and offer you the best alternative of sealing up your applications.